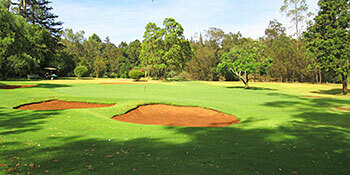 Sigona Golf Club sits to the northwest of Nairobi in Kikuya, just off the main road to Lake Naivasha, on a hilly site that was once a wattle tree plantation. Designed by the accomplished English course designer Tom Simpson and opened in 1938, the course lies near the Rift Valley, some six and a half thousand feet above sea level. The original 9-hole layout was routed around an elephant watering hole, which is the reason for that large mammal’s head appearing on the logo for the club. The current 18-hole course was substantially modified in the 1970s with the introduction of bunkers and the shortening of several holes to reduce the par from 74 to 72. Sigona may be famed in Kenya for its lush fairways but the convoluted contours also make this a tough track to play – no more so than at the 465-yard, par four 7th, rated stroke index 1 on the scorecard. Played from one of the few non-elevated tees on the course, the hole doglegs sharply to the left, and as the fairway slopes from right to left, a difficult awkward lie will almost certainly be faced for the long approach to a green tucked into the hillside on the right. The clubhouse is situated just off the very busy main highway that connects Nairobi with the Kenyan interior. Once you enter through the front door however, the noisy air-polluted outside world is left far behind, allowing you the chance to savour a classic old design from Tom Simpson, one of golf’s most accomplished architects. Many alterations have been made to the course since it was first brought into play more than three quarters of a century ago (in particular, the introduction of the water-fronted par three 11th is one rather unwelcome “modification” that sticks out like a sore thumb) but there’s still plenty of the original course layout to relish. The 7th is a fabulous par four, veering left to a green that’s benched into a small slope, and it’s followed a couple of holes later by a terrific par five which sweeps left to an elevated green sitting at the foot of a small escarpment. This ridge of high ground is then used for similar strategic effect at holes 12, 15 and 17, where suitably raised greens force golfers to play approach shots to well-bunkered, semi-blind putting surfaces. As a slight grumble, a number of the Sigona fairways would benefit from a program of tree removal to improve playability; for example, the gap through the trees from the 8th tee must be only fifteen yards wide and the old overhanging tree that sits short and left of the home green actually has two wooden supports to stop it from falling onto the fairway -- making it a prime candidate for some much needed chainsaw attention. The course may lack some of the polish of the other top Nairobi golf clubs, nevertheless, as a decidedly decent test of golf -- where an unaccompanied weekend round with a caddie costs less than 30 quid -- this charming old track more than holds its own against any of the others. It lies a bit on the outskirts of town in a shabby area next to a highway, but once the doors to the golfclub are opened you entered another world!Great layout, fantastic fairways, good greens, a nice clubhouse and all that for 25 Euros. Definitely one of the best coureses in nairobi! !